In his chapter on Comparative Company Law in the Oxford Handbook on Comparative Law, Professor Klaus J. Hopt, in a plea for more internationalization and interdisciplinary research, concluded that “[w]hat is really important to know – at least in an internal market such as in the European Union, but also beyond in a globalized world – is not company law in the books, but how company law functions within the company, on the market and beyond the frontiers.” The volume on German and Nordic Perspectives on Company Law and Capital Markets Law edited by Holger Fleischer, Jesper Lau Hansen and Wolf-Georg Ringe is a convincing contribution to modern company law and capital markets law scholarship from these perspectives. The Nordic countries are a special case in the global context. In a world dominated by economic criteria for all things they seem to disprove that ideology. Their economies run smoothly and are efficient, the living standards are high and yet they sustain a welfare state that provides for some of the most important needs of any citizen, such as the need for medical care in case of serious sickness, the need for education to enable the citizens to function as well informed citizens in democracies, as knowledgeable employees in their jobs and as well balanced human beings. It can be debated to what extent the book actually serves as a guide book as it does not offer the reader so much of an advice of where to go, what to see and when to do it. Rather the book offers an insight into what Rome is about. In line with this the book is light on text but rich in pictures, all of which show the city and its people from various angles. The visitor looking for information on where to eat, for example, given his or her preferred price range, would therefore probably be better off picking up a Lonely Planet guide. It is of course impossible in any single book to show Rome in its entirety. Indeed to expect such an achievement from any book is quite unfair. It is said that beauty is in the eye of the beholder and the most interesting thing about Hundra procent Roma is in a way not what it tells you about Rome but rather the insight it offers into how the city appears to the visitor. A visitor from Scandinavia, to be more precise. Visiting Rome is ‘a dream for many people’. The Rome that appears in this book is sweet and relaxed. Roaming the crowded streets you can almost feel how the half-frozen northerner relaxes little by little and is transformed into a curious ‘flaneur’. Both the pictures and the text reflect very strongly the northern ideal about the relaxed south. Thus Rome is a city ‘filled with intensity, romance and feeling’ and the book invites the reader to ‘see, hear, smell, taste and feel the true Rome’. So what then is Rome like in the eye of the visitor? Rome is a sunny place with nice weather. Judging from the pictures in the book, it never rains in Rome and the weather in general seems to be very pleasant. None of the people are wearing warm clothes but neither do they seem to be uncomfortable due to the heat. Rome has almost no houses built since the end of the 19th century and most seem to be much older even. Those who want to explore modern Rome might find some houses dating from Mussolini’s time in the 1930’s or a few constructed for the 1960 Olympics. In Rome you will either find streets and places which are crowded with people or which have no people or at least very few. The people in Rome seem to be either tourists, who are eagerly visiting the city’s many historical sites, or local people, who are either waiting for something or not in a hurry to get anywhere. Traffic does not seem to be a problem, though parking a car is a potential challenge and it is therefore advisable to drive either a very small car or a scooter. In general, life in Rome is lived outside of houses. If people go inside it is only for a short time to air their bed sheets from an open window. Then they will have a meal in a restaurant and stroll about to look at things located inside historical buildings. People in Rome who are not tourists (i.e. are not standing and gazing at monuments or historical buildings) seem to be rather old and one is unlikely to meet many children. This description might spell the true Rome to a visiting Scandinavian. At the same time it is probably a far cry from the true Rome of those who live there. The conclusion however is not that the former is in any way incorrect. Rather the two (and many others) co-exist. To suggest that a book is one hundred per cent Rome is obviously a step too far, but then who would buy a book with the title ‘half per cent Rome’? This book offers a straightforward definition of Symbolism as the starting point for investigating a complex and imprecisely understood art movement. Following a clear and easy-to-handle structure, the book opens immediately with an attempt to give a simple and comprehensive description of what Symbolism is: “a Symbolist work of art is characterized by 1) an artist’s desire to represent ideas and 2) a manipulation of color, form, and composition that signals the artist’s relative indifference to worldly appearances”. Facos does not take any term for granted. On the contrary, she defines and explores anew seemingly well-established concepts like evocativeness, dream, genius, spirituality, hedonism, occultism, Idealism and Decadentism, just to mention some of the most important. Sometimes the reading suffers from Facos’ schematic approach, but that is the only way to master such a wide field of research material. Symbolism is possibly the only ‘modern’ movement that, even with a founder and a manifesto (Jean Moréas in 1886 published the Symbolist manifesto in the Parisian newspaper Le Figaro), did not create a well-defined, recognisable group of artists. Symbolism’s borders are so underdefined (do they exist at all?) that they could include an enormous amount of 19th– and 20th-century artists. The book follows a chronological line of analysis, from a survey of the precursors of Symbolism to Symbolist currents in the 20th century. The history of the movement is revealed through a manifold collection of relevant facts, artists, literary works, music, philosophical reflections, technological innovations, in a constant dialogue with equally diverse cultural and social aspects, i.e. the actual contexts within which Symbolism developed. These aspects act like mirrors, each rendering a part of this multifaceted movement. 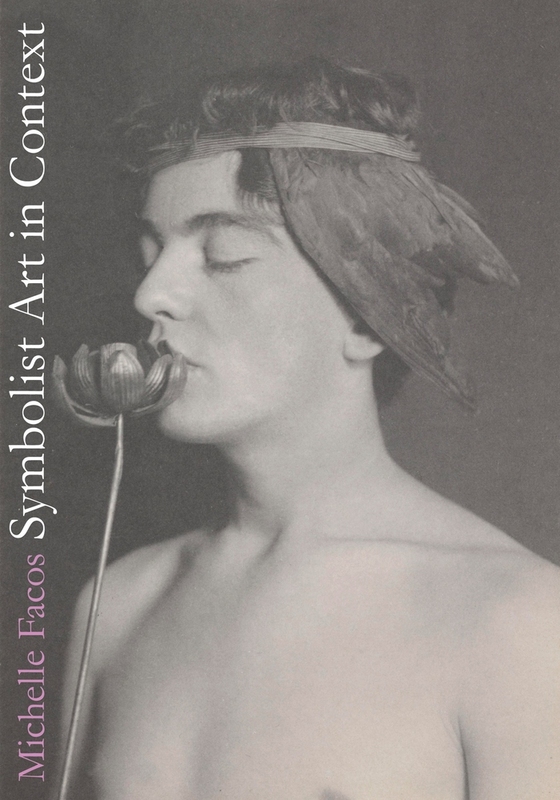 Facos’ approach to Symbolism includes also modern categories of analysis, such as gender studies (she investigates the role of woman in Symbolist art, as a muse, a sphinx, an angel or a demon), as well as practical aspects, like the chapter devoted to the promotion of the artists through art fairs, journals, exhibitions, unions and brotherhoods. In other words, Facos provides an attempt to describe the history of the movement from the perspective of the artists too. I include below the cover of the book. It is a photograph, not a painting: Hypnos, by F. Holland Day, dated 1896. It reveals the author’s choice to explore Symbolism by means of an unconventional path. As my scholarly interests are in mural painting and the revival of earlier techniques, I would have liked more space to be given to art mediums, for their symbolic and ideological meanings. Among the commendable qualities of the book, I wish to emphasise the broad geography of Symbolist art, which includes artists from less commonly studied countries such as Poland, the former Czech Republic, Scotland, Russia, and especially the Scandinavian countries. The bibliography is also quite extensive and genuinely international. In addition to the Italian authors quoted by Facos, I would like to remember the studies on Symbolist art by Luigi Carluccio, Maria Mimita Lamberti, Gianna Piantoni and Maria Teresa Benedetti. With her new book, Michelle Facos confirms herself one of the main scholars in 19th-century art, and among those who brought new life into the art history of Northern Europe, on a par with Patricia G. Berman for Norway and Denmark, and with Salma Sarajas-Korte, Marjatta Levanto and Riikka Stewen for Finland.